Everyone has different priorities on a trip to Japan. Me – I'm all about the weird animal stuff. One time, I made a special excursion to Mie prefecture just to see a dugong in an aquarium, and the top attraction on my list for Tokyo was a store that sells pet bugs. And if you've read my other articles on Tofugu, you know I'm obsessed with capybaras and shops for dogs. One unique Japanese invention is the cafe where you can have coffee and hang out with all kinds of critters. If all you know about are the cat cafes, you are way behind the times. There are now rabbit cafes, a reptile cafe in Yokohama, and several cafes in the Tokyo area devoted to birds of prey. When I went this past fall, it seemed like a shocking omission that this was my third trip to Japan and I'd never been to one of these animal cafes. But where to start? Cat cafes are so old hat that they're not even exclusively Japanese anymore. They're popping up all over Europe, the first one in London is under construction, and now someone's trying to open one in San Francisco. Boooring. The reptile cafe was out when I discovered that the animals are just on display, not wandering around like the cats. I've worked as a reptile keeper, so you'll have to do more than that to impress me. If I can't drink my coffee with the iguana actually in my lap, no way am I going to schlepp all the way to Yokohama. And birds of prey… I'm sorry, bird lovers, but actually, I wouldn't even cross the street to hang out with an owl. 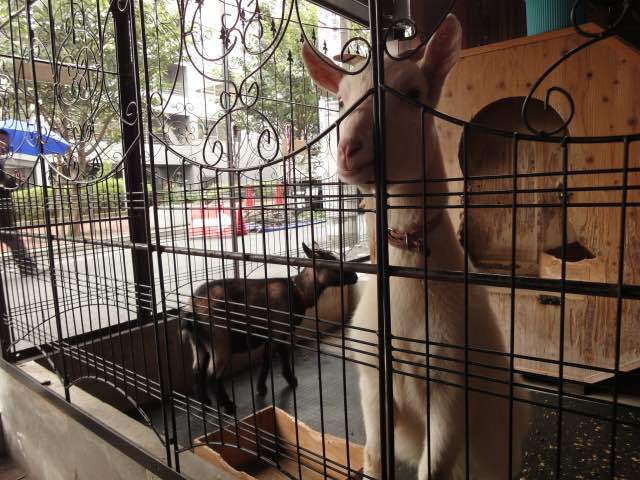 Then I discovered the obvious answer, because it is clearly the weirdest: In Shibuya, only a short walk from the famous statue of loyal dog Hachiko, in the very heart of the city, you can go to a cafe that has two goats. 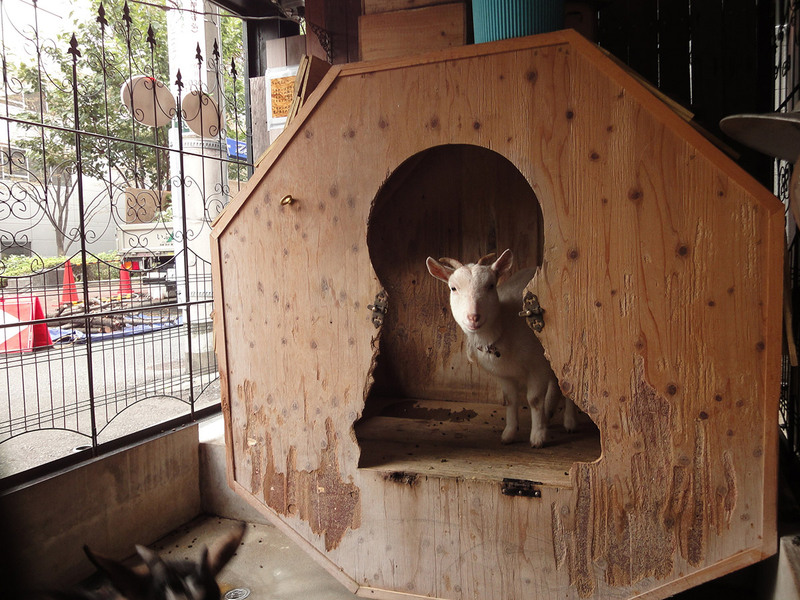 The goat cafe Sakuraoka is actually not a recent development: the goats arrived at the existing cafe in May 2010. They are two females, a brown one named Chocolat and a white one named Sakura (the obvious idea of naming her Vanilla apparently lost out to the Japanese compulsion to refer to cherry blossoms at every possible opportunity). When my friend and I arrived mid-morning on a weekday, it turned out that while the cafe is open all day and evening, they only serve food at certain times. The disadvantage of this was that I was starving, but the advantage was clear, because there's only one table that's actually right next to the goats. Since there were few other customers, the table was available, and we grabbed it. The white goat ran right up to us and stuck her head through the bars and tried to chew on my pants. It turns out this is typical, as Sakura is a known troublemaker. 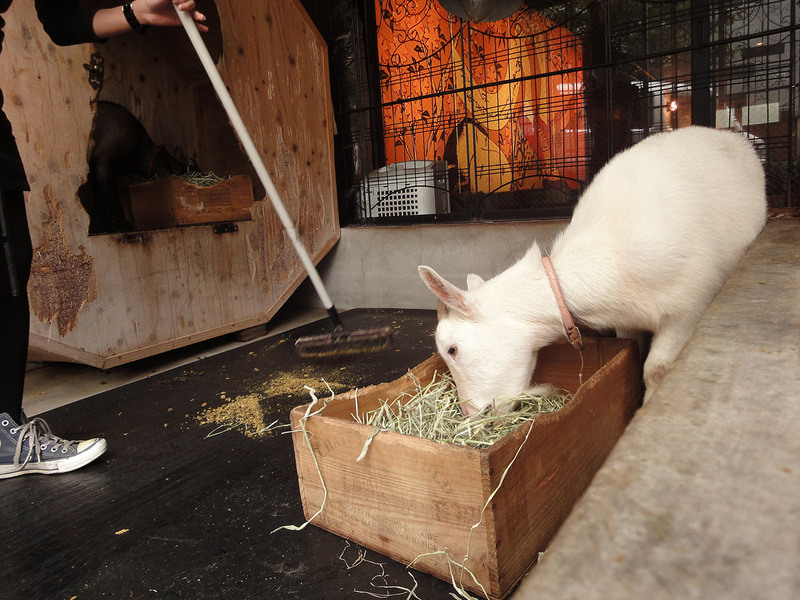 When a staff member came out to clean and give the goats some fresh hay to eat, she tied Sakura to one side of the pen, she told us, because otherwise she'll eat Chocolat's food. 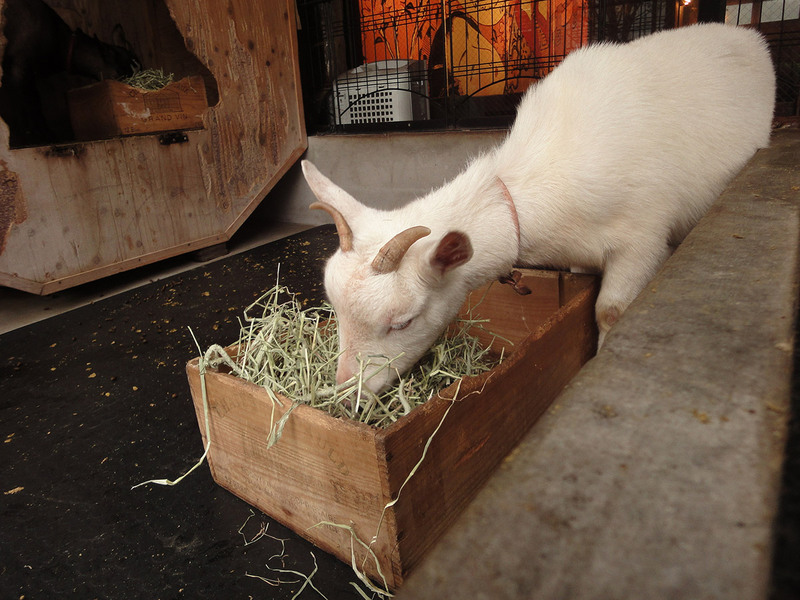 I later bought a book about the cafe's goats, in which Sakura's bio calls her "a strong-willed, slightly spoiled princess." I have to admit I was a little dubious about idea of a goat cafe, and I am definitely not squeamish about animals. I've always thought it was crazy that health laws forbid me from bringing my dogs into restaurants in the US, since my dogs are in my kitchen all the time and it's never made me sick. But coffee next to a barnyard? Never fear, there is nothing unappetizing about it. The goats are spotless, the pen is cleaned of the dry little droppings regularly, and there's only the slightest hint of the perfume of a farm. 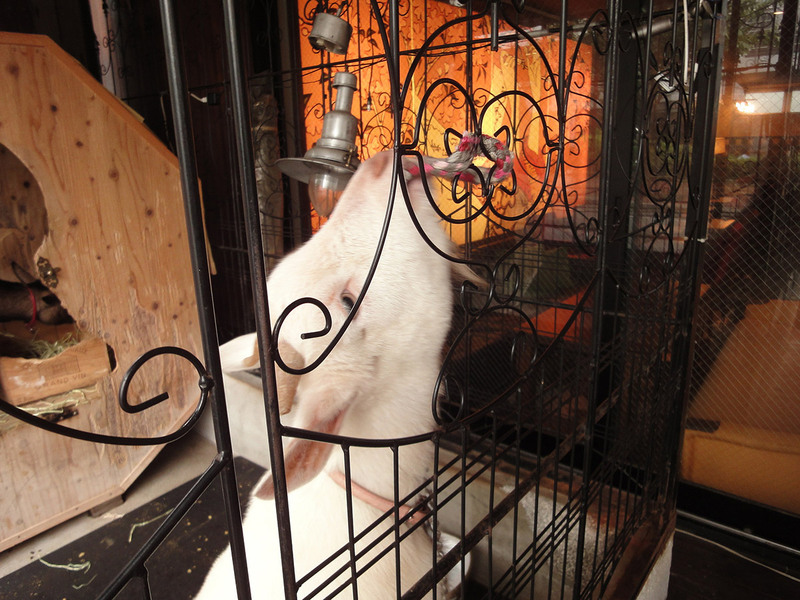 And if even that's too much for you, you can pick a table inside and look at the goats through a glass window. If on the other hand you want to get even more up close and personal with the goats, you can make a reservation to take them for a leash walk around Shibuya. The photos of this activity make it look more like they will take you for a walk, which I guess is not surprising given the combination of "strong-willed" Sakura and Chocolat, whose bio is "Relaxed, likes to go at her own pace." I can't report on the food, having not had the chance to try any, which was especially sad when I saw all the photos of enticing looking cakes on their Facebook page. I drank a mocha, but was too distracted by the goats to notice much about it. But I didn't miss the most important food item, the souvenir chocolates. They're chocolate covered rum raisins, presented on a bed of hay, and the cover of the box leaves no doubt about what they are meant to be. 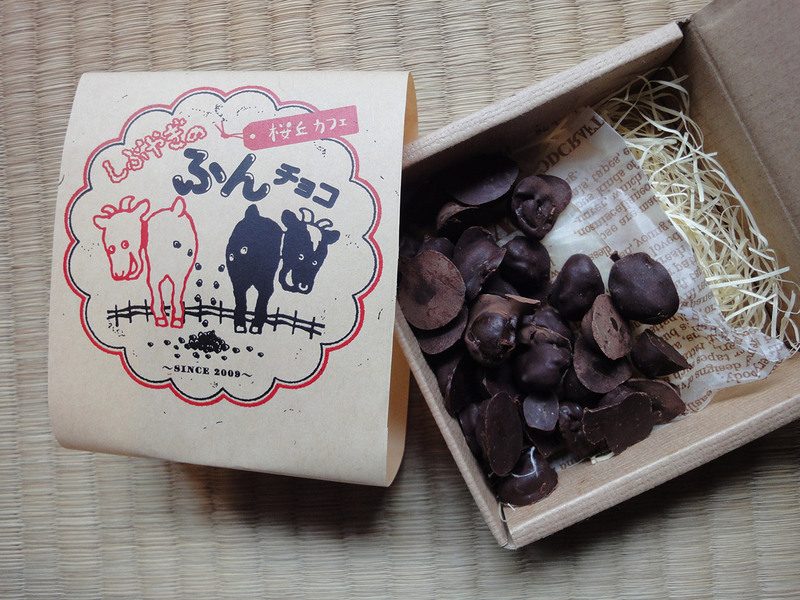 Who doesn't want goat poop chocolate as an omiyage? !